The Kinetic really shocked me. The Amethyst is different than it predecessors in the Emerald and Ruby. For me I never really cared for the Emerald, it just didn't match well to my game at all. The Ruby was better, it is really smooth and great on the fresh sport patterns. The Amethyst is a little cleaner than the Emerald was and has more continuation down lane. For me the Emerald got into the roll phase a little too soon and the Amethyst changes that. It goes thru the pins very well. I decided to drill this with a 50x4x80... I had a Cyborg Pearl drilled the same and absolutely loved it so went with this layout for this too. What I got was a phenomenal ball reaction that I haven't seen in the Kinetic line yet. It is plenty clean through the fronts, and the layout tamed the backend down some but still has plenty of continuation. This will be very useful when I want the ball to clear the fronts and not get too angular. I will be drilling another one of these with a pin up layout to utilize the angularity it can produce. The Kinetic Amethyst complements the Emerald and Ruby nicely as it will get further down the lane than both before responding to the friction. Due to the great length this ball offers, you should never run out of room when needing to play deeper inside. As with the other Kinetics, energy retention and hitting power are not a problem. This ball is perfect for drier THS’s or tournament conditions where the heads and mids are a bit toasty. 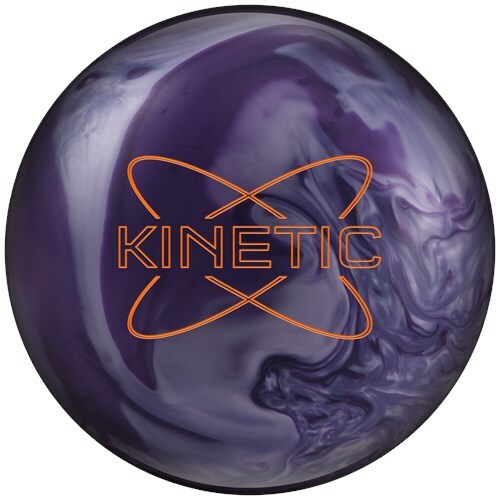 This is the first Kinetic series ball I have drilled and I was really impressed. Having a Pearl cover gets the ball through the heads really clean but the ball saves it punch for going through the pin deck. I have a Rhodman Pearl & a Verdict Pearl that are about 4 & 2 different. They are both smooth off the spot for me. The Kinetic Amethyst fit right between those two but has a little different shape, little stronger finish at the pins. Gonna be a really nice addition. The color is great also. My ball driller and I laughed about the layout on this one. I wanted to try something different so we did 40x5x5 (pin about 2.5 almost 3 inches above the fingers) I like the motion I get from the Amethyst, I found this layout to be versatile for my style. I was able to play in or out on the lanes (minus the short pattern for sport I couldn’t get the ball to stop which is understandable) On House I was able to start right and migrate left. The Amethyst didn’t lose energy through the pins. The Amethyst got stronger and stronger after a few shots which is not wasn’t a bad thing. I was impressed with that. On the medium and long sport patterns I was able to play straight as well as play in without losing energy through the pins. This is going to be a good ball for me, next is to play around with a few surface adjustments.